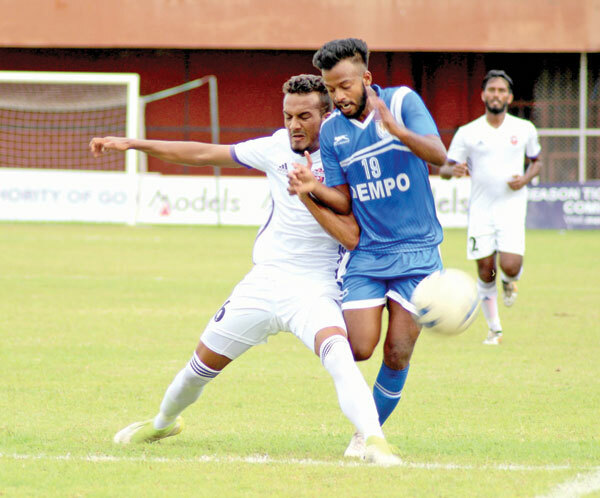 VASCO: Dempo Sports Club rose to the occasion to outsmarted FC Pune City 3-1 to enter the semi-finals of the AWES Cup, organised by Association for the Wellbeing of Elder Sportspersons in collaboration with the Sports Authority of Goa (SAG), at Tilak Maidan, here, on Sunday. Needing a draw to secure a place in the semi-finals, Dempo SC did better than expected as they floored last season’s Indian Super League (ISL) semifinalists to top Group A and book a last-four clash against Sporting Clube de Goa on Tuesday. ONGC (Mumbai) and Salgaocar FC will face each other in the second semi-final on Wednesday. There were no goals at half time but, although under pressure, Dempo SC still managed to create three good chances, only for Joaquim Abranches, Jessel and Latesh to fall short. Pune had plenty of the ball but did not make too many incisive moves. In the second session, Dempo SC drew first blood through Mario who headed home a fine cross from the left inside a crowded goalmouth. Needing to win, Pune City upped the ante but Dempo SC dealt them another blow five minutes later from a free-kick which was awarded after the goalkeeper stepped out with the ball still in his hands. Jessel stepped up to take the free-kick on the edge of the box and finished it with a well-worked move. Latesh made it 3-0 when he converted a penalty, which he had himself won after being brought down by Rohit Kumar inside the box. There was now no way back for Pune City, although they did manage to pull a goal back in the closing stages through Jakob Vanlalhimpuia, who was fed on the platter inside the box and had to just divert the ball into the goal.